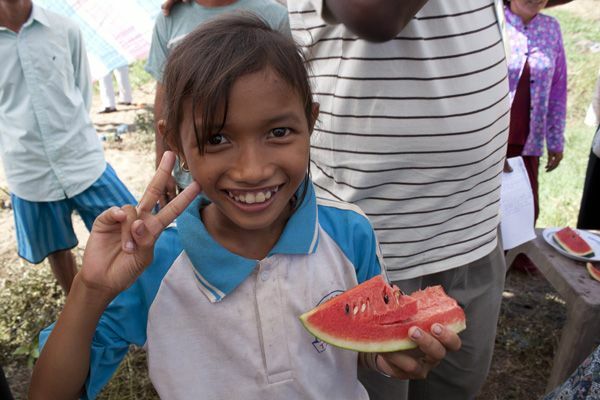 The Nguyens’ daughter, Oanh, shows off a melon. Photo by Kate SheppardGreetings from Vietnam! I’m here for two weeks reporting on climate change adaptation, which can mean many things around the world. In the Thua Duc commune on Vietnam’s southeast coast, it’s meant the introduction of new watermelons. Nhan and Chan Nguyen grow melons, peanuts, casava, and turnips here, on a patch of land off a dirt path shooting off of a dirt road that turns off from another dirt road. In other words, they’re pretty far out in the rural reaches of Vietnam. Their small, tubular green melons poke out between the vines, shining in the hot afternoon sun. Ditches of stagnant water running beside the field give off a pungent, boggy smell. 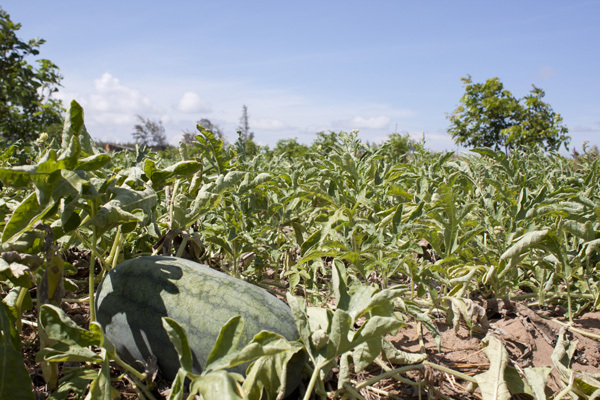 Through a grant from Oxfam, the Nguyens and nine other families were able to start planting a different variety of watermelon instead, a more resilient variety that wouldn’t suffer as much in unfavorable weather. And they were able to buy black plastic to cover the rows of seeds after planting, which helps lock water and heat in the sandy soil to coax the vines out of the ground. The project is more about adopting better agricultural methods, something that’s needed with or without climate change. But the effect Oxfam is hoping to get from the project is making farmers more resiliant to whatever nature might bring them. 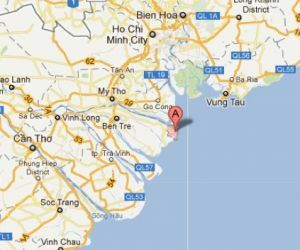 The cost of the projects per family was 3.5 million Vietnamese Dong—which sounds like a lot, but is only about $175 US. But it’s a significant amount of money for a farmer who, even when prices are good, can only fetch 5,000 Dong ($0.25) for a kilo of melons. When prices are bad, which they’ve been recently due to an early storm this year, they can only get about 2,000 Dong, or $0.10. In the first year of the program in 2009, Oxfam worked with 10 families, nine of which were able to turn a profit, ranging from 1.5 million Dong ($75) to 6.9 million ($345). The international aid group has since expanded the project to 50 local families. 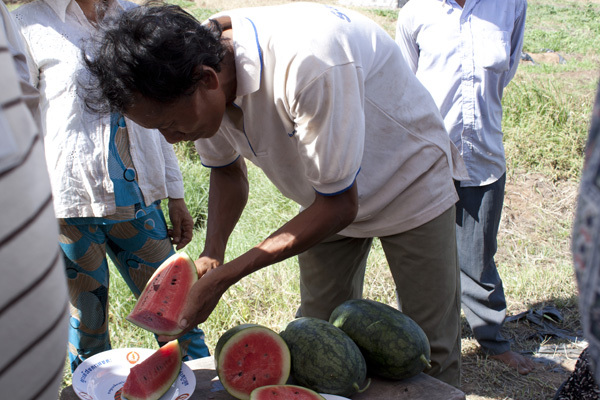 The Nguyens were quite excited to show me their products, plucking several small, ripe green melons from the field. They split the sun-warmed melons into eighths, dripping sweet pink juice as they passed them to eagerly awaiting visitors.